Maurizio Argenziano often collaborates with the experimental actor/performer/nonmusician Tonino Taiuti , also as trio with Vincenzo De Luce (Zero Centigrade). 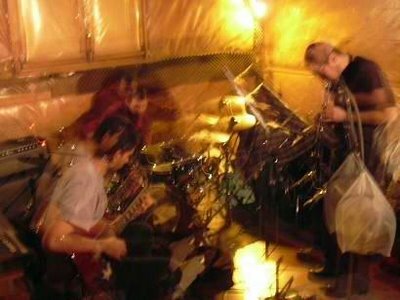 A Spirale take part, during the 2007, to national network TEMPIA composed by musician, video and body performer, result of this experince is the collaboration with contrabassist Roberto Bellatalla involved from the last ’70 in the Duch and English radical improvising scene. With other (no)/musician from Campania founded “Collettivo Ø” give to the practice of ensamble and impro music. Then M.Argenziano, M.Gabola meets SEC_ (synth and electronics) founder of the band Weltraum, producing the same titled album ASp/SEC_; as duo, Mario and SEC_, founded another project called Aspec(t), also both involved, with a large collective of people, in the organisation of the indipendent festival Altera!, about critical think and the connection between “the new musical practice” and the political movements. In the end of 2008 ASp/SEC_ meet One Starving Day drummer F.Gregoretti, founding the avant-noise supergroup Strongly Imploded. Mario Gabola in the 2010 start to collaborate with composer/scientist Agostino Di Scipio, founding a duo called Up-Set. – A Spirale collaborations include: Alexei Borisov[Ru], Olga Nosova[Ru], R. Chatham[USA] , E.Chadbourne[USA], M.Cooper[UK], The Hub[USA], ClaytonThomas[AUS], Hyph[DE], Ignaz Schick[DE], Michael Renkel[DE], J.Vandesande[NL], J.Kocher[CHF], J.Wright[USA], K.Yamauchi[Jap], S.Lemporte[Fr], D. Sciajno, V.Tricoli, S.Borrelli (ETRE), Andrea X Ferraris, Jealousy Party, Mat Pogo, Andrea Belfi, Psychofagist, Aldo Becca, Cris X, A.Mainenti, R.Pugliese, A.Ferraris, Anatrofobia, Lo dev alm , Tanake, N. De Martino, Roberto Bellatalla, Fabrizio Spera, Splinter Vs Stalin, Fune, St.Ride, Taxonomy, R.Fega, P.Innarella, Lendormin, T.Loconte, S.Dietrich, R.Ciunfrini, C. De Fabritis. This entry was posted on Wednesday, June 13th, 2012 at 05:38. You can follow any responses to this entry through the RSS 2.0 feed. Both comments and pings are currently closed.